Email marketing remains one of the most popular and effective marketing strategies around, and it shows no signs of slowing down. Email marketing is a wise choice for any type or size of company, simply because it works, and it is easy to implement. A big reason that email marketing is so easy to implement is because smart business owners let a software program do all of the hard work for them. The key is choosing the right email marketing software that fits your needs. Here is some great information on how to choose the right email marketing software for your business. Smart business owners always have the bottom line in mind when making purchase decisions. Email marketing software has a wide range of prices from the extremely inexpensive to the extravagant. The price of a program is often reflective of the extra features it offers as well as other factors. If cost is a major concern to you, stick with something well within your budget. If you have more flexibility, do some price comparing to see where you can get the most bang for your buck. Buying a software program that no one in your office can figure out how to use is nothing more than a waste of money. Read the reviews and keep your own abilities in mind. Make sure you pick a software package that either you or your marketing department can use easily and will not be so frustrating that it is not worth the hassle. Most email marketing software programs have been used and reviewed by everyday users. Check out both the positive and negative reviews that an email marketing software program has and make an objective decision. Look for similarities in the experiences of different users and other trends that can give you an idea of how well the product works. You can easily find reviews for these products on the products’ respective website and social media pages. Making comparisons between the various programs is a great way to determine which one will best fit your needs. Make a list of the qualities you need your chosen software program to fill and then make another list that includes the qualities of the different available products. When you see the data directly in front of you, it will be easy to compare the different choices to see which is the best choice. The ability to easily integrate your systems is integral to the success of an email marketing software program. The software you choose needs to easily work with your customer relationship management (CRM) software. That way you can easily and quickly update email lists without hassle or stress. Without smooth integration, you may be stuck updating lists manually, which can be time-consuming and problematic. An increasing number of people are checking their emails from mobile devices rather than laptop or desktop computers. So, any emails you send need to be mobile-friendly in every sense. You can easily lose customers if your emails do not display correctly or clearly for people who use mobile devices. Over a short period of time, that can result in lost revenue for your business. If you are going to go to the effort of creating and initiating an email marketing campaign, you likely want to communicate with the people who receive the information. If your campaign is extensive, it is not feasible to send personal response messages to anyone who reaches out after receiving the initial email. Look for software that allows either automated responses or response tickets. Choosing the best email marketing software in an incredibly important decision, as it will help you get the responses you need. So, you need to approach it with your needs in mind so you can make the best choice. Evaluating these factors and measuring them against your needs is a great place to start. 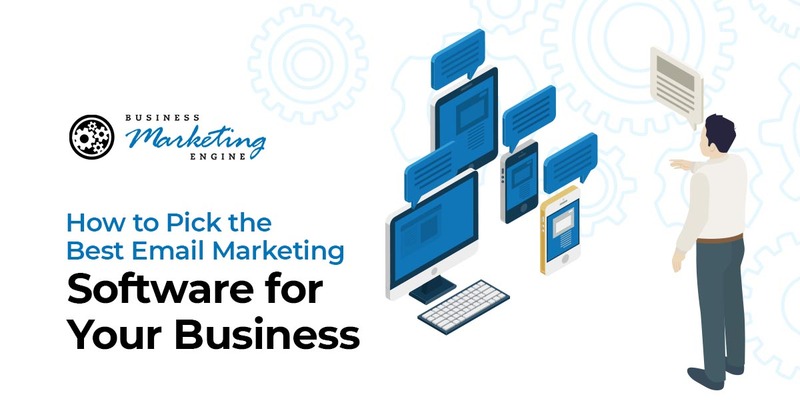 For more information about choosing the best email marketing software, visit the Business Marketing Engine website today.